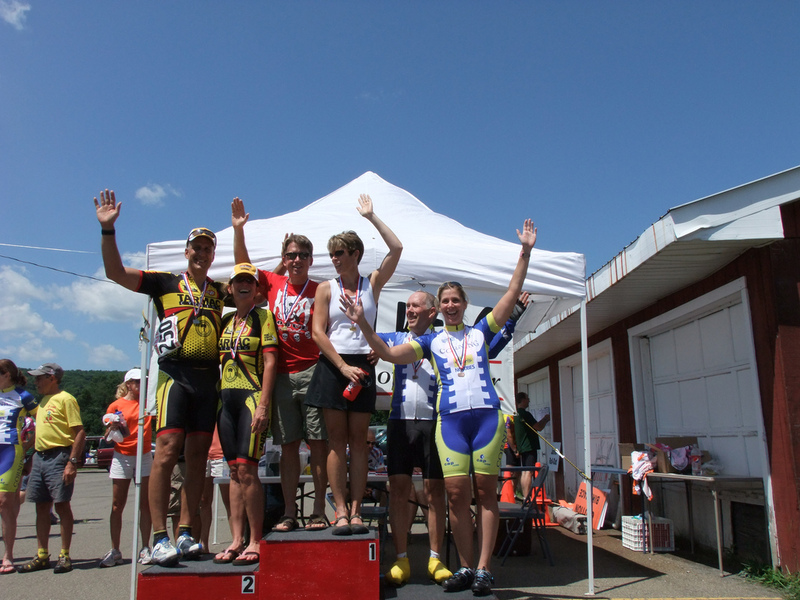 I have been bike racing for a couple of years now, with fairly mediocre results. I’m usually in the top 3rd, but I sometimes wonder why I race. I got a late start at athletics. I am old compared to most of the women I race with. But, I keep working- I don’t give up- and I have gotten better. This weekend I have been wondering if maybe I am just good at suffering. Does being really good at suffering make me a strong bike racer? Maybe I should leave it to the younger women. 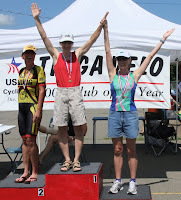 I did have my first Podium win on June 4th at the Floyd Bennet 20km Time Trial. I took 3rd place cat 4 women. It was really fun racing around the pancake flat race track, into the wind. I had already done a team time trial a half an hour before with Ed, Jon and Rob. Their 4th man had dropped out, so they asked me! I was feeling strong and having a good day. Victor was there too and took 1st place in Cat 5 men. Unfortunately we had to leave before I even knew I won. Later, I got a check in the mail for twenty whole dollars! This month I convinced these same buddies to drive to Tioga NY and enter the State Championships. This race is one of the few opportunities to race in my age group. Victor couldn’t make it, so Ed and I entered the mixed tandem race. It would mean two 40km time trials back to back. Ed's truck- we had 4 bikes- one a tandem. This time, I was able to do my individual race first. I had just two competitors, but they were strong. The women that beat me (by 5 minutes!) has won this race for years and also done well in Nationals. But the woman I barely beat has years of solid top 10 and podium finishes. I had about a half hour before the TTT but I was feeling good. Ed had placed 3rd in his first race and we had two strong teams to race against. The first team won handily, but we came in a strong second. I missed the first podium and was afraid I would never get to have that podium moment. But, Ed and I crowded up there and got our silver medals! Now I had two silver medals around my neck. They clanked against each other every time I moved and made me smile. Finally on the podium for real! 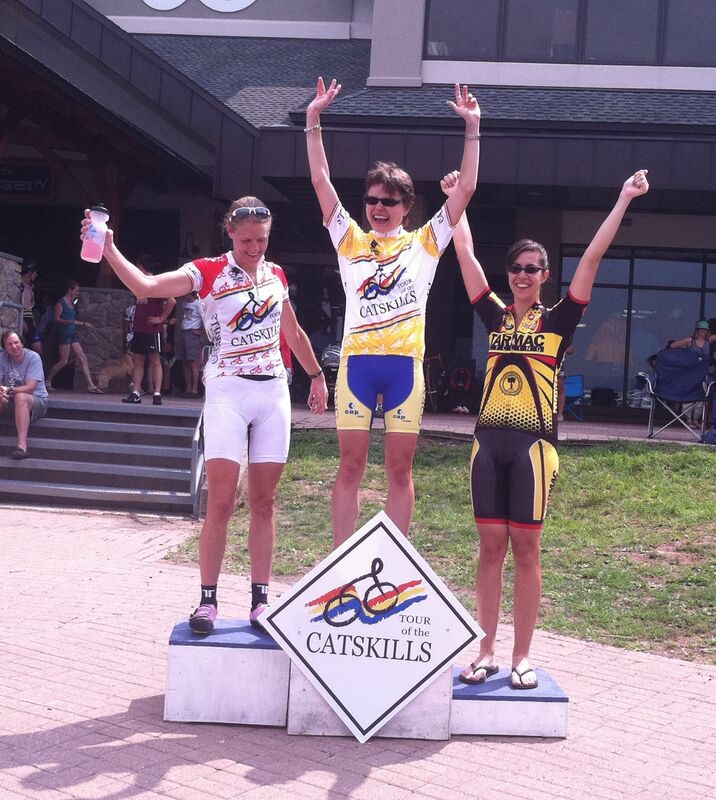 This weekend I faced my first stage race- the Tour of the Catskills. It seemed like a good idea when I signed up. I had never done one before. I convinced the women on my team (all new to bike racing) to sign up. Many of the men on our team were doing it. I found a house for us all to stay. Christine has a condo in Hunter Mt., so some of us stayed there as well. We planned to share meals and post race parties. The race started with a 20km time trial with an uphill finish. Meg got her number- 666! I told her it was a good omen for the Devil’s Kitchen climb the next day. I did well with a 6th place finish. She placed just behind me without any aero gear. Christine and Bari also did well. Christine looked amazing in her borrowed TT bike and she did much better than she expected. We all went to Christine’s and had a fun meal. I was very unsure of what would happen the next day because on our pre ride (on a very hot day) I had gone into heat exhaustion on the Devils Kitchen climb. The climb is almost 3 miles and incredibly steep. The route is 68 miles and the devil comes at about mile 60. I was delighted to find myself with the pack at the top of the first KOM (king of the mountain- a big hill where you get points if you are the first over) and got to fly with the peloton all the way to the base of the mountain. That is my favorite part. In the pack all your senses are crackling. You get to play with the drafts and enjoy the power of the group. It’s an incredible sense of sisterhood and strength. We went through the food stop and there was dependable Nick handing me a bottle. We raced on towards the mountain. At the bottom, I let everyone pass and settled in to climb. I figured I would zigzag my way up. It was slow, but steady and it worked. At the corkscrew- the steepest part- my left quad cramped and I screamed in pain- each time I pressed my foot to the pedal I screamed- and kept riding. As it leveled, I calmed my breathing and mentally tried to relax the muscle. It worked and I was able to keep climbing all the way to the top. I finished just before the rain. Victor was there to help me off my bike and give me a hug. We hung out to see Meg take the podium for 3rd place! It started to rain heavily but we stayed and cheered Bari and Christine as they finished looking strong. Although the guys were not in yet, we fled back to the house to shower and get warm. Later, everyone came to our place for another feast. I had come in 11th for the day and 11th overall. There was no giving up, but I was pretty sure I would not be able to do as well the next day. I was feeling pretty good physically, but I was afraid. Still, I wanted to support Meg and if there was any way I could help her, I would. It was much more hot and humid than they had predicted. The heat index was around 100. Bari and Christine and Jon dropped out to cheer us on. Nick and Victor did the one-day race. John, Brian, Ed, Rob, Meg and I all ate a hearty breakfast and went to race. As Meg and I warmed up we chatted and I started to relax and enjoy myself. When the race took off, there I was again, blissfully flying with the peloton. The big long climb started about 20 miles in. I dropped back and rode with a few other women. One if them had come in right behind Meg and was a contender for Meg’s 3rd place overall. So, I figured I would just stay with her to keep an eye on her. I remembered she was very strong on the flats, so I hoped she might pull us back to the peloton. But, as the heat beat us down she faded fast. At one point she even veered into the grass. Another woman pulled ahead- I went with her. She and I worked together after the first KOM for the two and a half miles of flats. It seemed like the route was all uphill or down. My Garmin said 60 miles and 6000ft of climbing. Soon we picked up another woman that had been dropped. They were both very young. One was not drinking enough and I nagged her. “Sorry, it’s just the mother in me.” They were not fast on the descents, so I kept waiting for them. I probably should have just soloed, but I preferred their company. 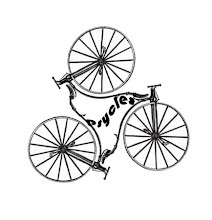 Then, I saw the Babylon Bikes jersey up ahead. 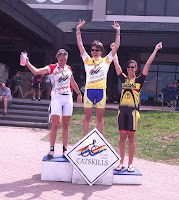 A woman named Jenn, I raced with at Battenkill and helped me for the last miles, was in that jersey. I called to her to jump on my wheel. She said she was cramping and hurting, so I gave her some electrolytes and slowed down a bit. We got to the bottom of the second KOM and it was a wall. I started zigzagging and she followed my lead. Somehow we made it up and kept on. We passed another woman that I had been chatting with earlier. She claimed to be the oldest in the peloton at 46, but I informed her I was 48. We discovered we both have MS and chatted about our medications. I called to her to hop on, but she was too far gone. I was sorry to see her in such pain. The heat was really bad and cramping is very common with MS. I had been popping electrolytes and drinking lots of water, so I was OK. I did see her come in to the finish later and ran up to hug her. She burst into tears. Meg came up and we helped her off her bike as her husband arrived. Wow. Just wow. I was totally exhausted, but felt energized by the whole experience. Meg’s smile was radiant as she stood on the podium and raised up her arms. She is 27 and has years of improvement ahead of her. Third place in her first stage race is an amazing accomplishment. Victor took 2nd in the one-day race. Nick had a really good time. I was very proud to be wearing the Tarmac colors as I saw the young guys coming in. 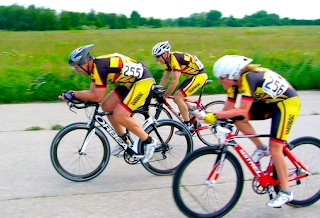 They finished seconds from having a cat 4 team win. Rob came in 8th overall and John came in 9th. Brian and Ed finished strong. I was 11th overall- but I had wanted to be in the top 10. That is the magic number- the cut off between winners and losers. If I had left Jenn there on the road, or if I had just pushed harder… But those choices are part of what it’s all about and I feel good about what I did. 30 women started and only 19 finished. If there were a 45+ age group as there is with the men, I would have won. We all went back to the house and had another meal together before staggering off for home, spent but proud. Maybe by next year I could lose 10 pounds and get up those hills just a little faster. Maybe I will give up racing altogether and leave it to the young ones. Maybe I could just do what I have been doing. I guess I don’t have to decide just now. The truth is, it’s good that I get to decide at all.